After about three years of legal battle, the Wuye Ultra modern Market in Abuja has finally opened for business. The market, estimated to have cost N5.5 billion was a beehive of activities at the weekend as shop owners commenced full blown business transactions. Traders who had paid for the shops have now been allowed to take over their shops amid tight security. The traders were happy that they were able to move into the shops they paid for after a protracted litigation over the ownership of the complex. To ward off criminals, armed police officers and other security agencies mounted guards right at the entrance of the market. The project for the construction of the ultramodern market was awarded to All Purpose Shelter, under a Public Private Partnership (PPP) arrangement‎, even as some traders claimed they were given provisional allocation letters by the Federal Capital Development Authority (FCDA). Under the arrangement, a list of eligible allotees was given to the developer by the FCDA, and the allotees were asked to pay for the development of the market in three tranches, with a deposit payment of 50 per cent of the total sum while the remaining 50 per cent could be spilt into two payment of 25 per cent each. While some of the market men and women, as well as shop owners complied with the arrangement, some aggrieved members didn’t, claiming that the FCT authority had promised to build them a new market without paying a penny, a development which led to a legal battle between the two parties after the market was completed. A director of the All Purpose Shelters Ltd, Mr. Segun Balogun, who spoke to our correspondent at the market, assured of maximum security in the market, saying it was God’s intervention that the market eventually opened for business. Giving an insight into the crisis that rocked the market, Balogun said, “The situation now is calm and we thank God for devine intervention. The intervention came through the FCDA which called for a stakeholders’ meeting in which it was discovered that developers have the right to operate their market. “This Wuye Market was conceived under Build to Operate and Transfer‎ (BOT) and it is one of the four major markets that we have within the Federal Capital Territory spread in Garki, Mabushi, Kaura and Wuye here. They came up at the same time under but unfortunately something happened after the commissioning. “Some people came up and said they had administrative papers from the FCTA in which they paid N2,000, N5,000 and N8,000 and these they want to use and claim their shops in this edifice you are seeing here. But we tried to explain to them that the said monies cannot be used to acquire the kind of shops we have here. 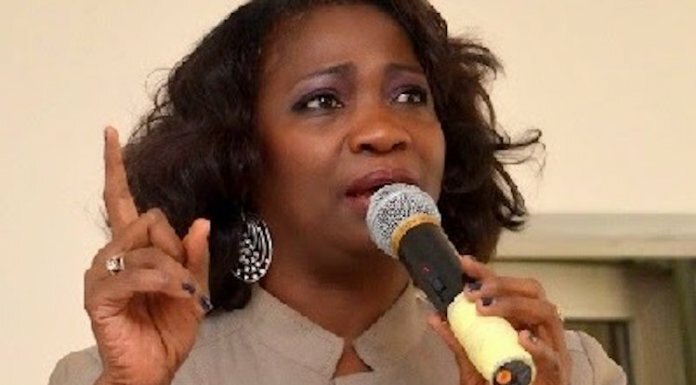 Also speaking, the national president of Market Women Association of Nigeria, Chief Mrs. Felicia Sani dismissed those calling on President Muhammadu Buhari to intervene as fraudsters ‎whom she accused of duping innocent traders of their monies. ‘Mama Market’ as she is fondly called also vowed that those who fraudulently collected monies from people with a promise to secure shops in the market for them must be made to account for them.